KINGSTON, Jamaica (AP) -- Hadi Mezawi has never set foot on the Caribbean island of Dominica, has never seen its rainforests or black-sand beaches. But he's one of its newest citizens. Without leaving his home in the United Arab Emirates, the Palestinian man recently received a brand new Dominican passport after sending a roughly $100,000 contribution to the tropical nation half a world away. "At the start I was a little worried that it might be a fraud, but the process turned out to be quite smooth and simple. Now, I am a Dominican," said Mezawi, who like many Palestinians had not been recognized as a citizen of any country. That passport will help with travel for his job with a Brazilian food processing company, he said by telephone from Dubai. Turmoil in the Middle East and North Africa has led to a surge of interest in programs that let investors buy citizenship or residence in countries around the world in return for a healthy contribution or investment. Most are seeking a second passport for hassle-free travel or a ready escape hatch in case things get worse at home. 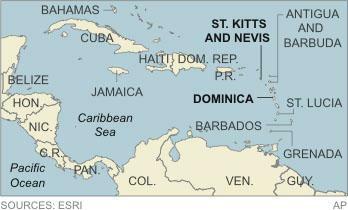 Nowhere is it easier or faster than in the minuscule Eastern Caribbean nations of Dominica and St. Kitts & Nevis. It's such a booming business that a Dubai-based company is building a 4-square-mile (10-square-kilometer) community in St. Kitts where investors can buy property and citizenship at the same time. In its first phase, some 375 shareholders will get citizenship by investing $400,000 each in the project, which is expected to include a 200-room hotel and a mega-yacht marina. Others will get passports for buying one of 50 condominium units. "The more they fight over there, the more political problems there are, the more applications we get here," said Victor Doche, managing director of another company that offers four condominium projects where approved buyers are granted citizenship in St. Kitts, which is less than twice the size of Washington D.C. It's impossible to say how many people have used the cash for citizenship programs. Officials in both countries declined to respond when asked by The Associated Press. "Why do I have to speak on that?" said Levi Peter, Dominica's attorney general. "I have no explanation to give to AP." But Bernard Wiltshire, a former Dominica attorney general, said there were already around 3,000 economic citizens when he left government about a decade ago. The country now has roughly 73,000 inhabitants in all. "Investor visa" or citizenship programs are offered by many nations, including the United States, Canada, Britain and Austria. But the Caribbean countries offer a fast path to citizenship at a very low cost. The whole process, including background checks, can take as little as 90 days in St. Kitts. And there's no need to ever live on the islands, or even visit. A foreigner can qualify for citizenship in St. Kitts with a $250,000 donation to a fund for retired sugar workers or with a minimum real estate investment of $400,000. The minimum contribution in Dominica is $100,000. By contrast, a U.S. program allows visas for a $1 million investment in a U.S. business employing at least 10 people or $500,000 in designated economically depressed areas. The investor can apply for permanent residence in two years, and seek citizenship after five more. Demand in Canada is so great that the country stopped accepting new applications in July. A Dominica passport holder can travel without a visa to more than 50 countries, while a St. Kitts passport provides visa-free travel to 139 countries, including all of the European Union. That's a big deal to people in countries from which travel is restricted or whose passports are treated with suspicion. Critics say the programs undermine the integrity of national passports and have security risks. While there are no known cases of terrorists using the programs, experts say that's a possibility with many visa arrangements anywhere. "No level of scrutiny can completely guarantee that terrorists will not make use of these programs, just as background checks cannot eliminate the risk that dangerous individuals will not enter the country (the U.S.) on tourist visas, as students or as refugees," said Madeleine Sumption, a senior policy analyst at the Washington-based Migration Policy Institute. Canada imposed visa requirements on Dominica citizens a decade ago after complaining that suspected criminals had used island passports. And in 2010, Britain said it was considering visa requirements for Dominicans, prompting the island to review its 20-year-old economic citizenship program. Dominica never publicly released the results of its review and Britain took no action. St. Kitts closed its program to Iranians in December 2011, shortly after Iranian students stormed the British Embassy in Tehran. Iranians had earlier been a major source of applicants, according to Doche. Some locals worry the programs could get out of hand if conditions worsen abroad. "There could be a flood of people with our passports relocating here," said Dominica's Wiltshire. "What are we going to do then? Really, this program must be halted. It's dangerous to us and dangerous for our neighbors." St. Kitts opposition leader Mark Brantley said the citizenship program was bringing much needed revenue to the debt-swamped islands, but he said there should be better oversight and public accounting. "We do not see that sufficient controls are currently in place to ensure that bad people, for want of better language, do not get access to our citizenship," he said. It's not just economic refugees who are interested in the programs. American Neil Strauss wrote of securing citizenship in St. Kitts in his 2009 book on survivalist preparedness, "Emergency: This Book Will Save Your Life." "The same way we have a backup drive for our computer in case the hard drive explodes, I just felt like I wanted a backup citizenship in case the same thing happened to my country," Strauss said during a phone call from his home in Los Angeles. Like most economic citizens of St. Kitts, he rents out his island property. Some other struggling Eastern Caribbean islands are looking at adopting the St. Kitts model. In Dubai, Mezawi said he keeps meeting fellow Dominica passport holders, mostly people of Iranian and Palestinian background. "After the Arab Spring, it's become more difficult for us to really travel around the world, even in the Arab region," he said. "But being a citizen of Dominica, it is much, much better for us."